Full disclosure: I love turtlenecks. They are ubiquitous yet mysterious, alternative yet classic, and always timeless. Lucky for me, turtlenecks are back in a big way this year. If you want to learn more about the trendy turtleneck, you’ve come to the right place! Below, I’ll take you through a brief history of the turtleneck and offer styling and shopping tips. Let’s go! Like many fashion classics, the turtleneck started as a utilitarian choice for workers due to its practicality and warmth in the 1880s. Then, sailors picked it up in the 1930s. In the ’40s and ’50s, stars like Lana Turner and Jayne Mansfield popularized the turtleneck, and other sweater styles. They wore the turtleneck in form-fitting knit fabrics over cone bras. Despite this more sultry and mainstream entry into fashion, anti-establishment “intellectuals” and bohemians soon co-opted the look. Audrey Hepburn’s look in Funny Face (black turtleneck, black cropped pants, and black flats) represents this ’60s turtleneck iteration well. The turtleneck stayed popular with activist crowds in the ’70s but was soon watered down in the ’80s and ’90s. This lead to the short unpopular period for the turtleneck in the early 2000s, minus Steve Jobs’ affinity for them. But turtlenecks are making a comeback. Today’s fashion it crowd has come to believe that under “pop culture’s excessive saturation of the naked body”, the turtleneck has a subtle and mysterious appeal. Want more info? Bustle explains the piece’s full history quite well. Below this fashion classic is styled in two different ways. I chose a classic black ribbed turtleneck from H&M that, despite its timelessness, won’t break the bank. 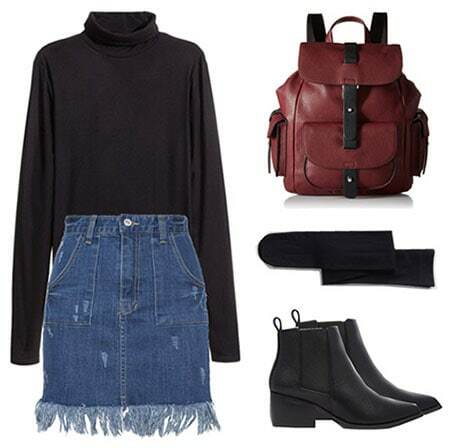 Ease in to wearing the turtleneck by pairing it with your go-tos for class: Denim, flats, and a backpack. This denim mini is slightly pricey, but the fringe is so on-trend, you’ll wear it constantly this year. Tights and your favorite black shoes pick up the black of the turtleneck. Finally, the leather backpack is a style upgrade from your JanSport, but is still very functional for class. Go all out by mimicking the artistic Bohemians of the past with this look. This turtleneck looks especially sharp tucked into cigarette-style trousers. Loafers add a cool menswear touch and look great paired with the cropped pants. A satchel is practical and adds the perfect amount of chic to this otherwise hip and alternative look. Raid your mom’s (aunt’s/grandma’s etc.) closet. While this is not usually where you’d find your most stylish picks, the turtleneck has been around for generations and hasn’t really changed much along the way. You may be able to find this fashion piece (along with a little family history) for free! Consider color. Black turtlenecks will always have a special place in my heart, but I think the shape of the turtleneck can really shine through in lighter hues. Consider weight. A big wool turtleneck definitely has a different vibe than the more sleek versions I styled above. In my mind, thick wool turtlenecks have more of a cozy casual winter vibe, whereas tighter fitting cotton styles are more formal and sleek, and better for springtime. Both are good, but both serve different purposes. How do you feel about the turtleneck? Do you have any tips on how to wear them or what to consider when buying? Any other fashion items you’d like to know more about? Leave a comment and let me know!